True Blood is an American television drama series created and produced by Alan Ball, who also created Six Feet Under. True Blood is based on The Southern Vampire Mysteries series of novels by Charlaine Harris, and details the co-existence of vampires and humans in Bon Temps, a fictional small Louisiana town. The series centers on Sookie Stackhouse (Anna Paquin), a telepathic waitress at a bar, who falls in love with vampire Bill Compton (Stephen Moyer). Following the creation of synthetic blood, vampires have progressed from legendary monsters to fellow citizens overnight. Sookie Stackhouse (Anna Paquin) is a telepath and waitress at Merlotte’s in the small Louisiana town of Bon Temps, owned by Sam Merlotte (Sam Trammell), a shapeshifter—though this secret is kept hidden. One night, Sookie meets Bill Compton (Stephen Moyer), a handsome 173-year-old vampire who has returned to Bon Temps following the death of his last remaining relative. As she cannot hear his thoughts, she finds it easy to be in his company and, over the first season, the two become romantically involved. Back at the end of August, me & Jay went to a wedding and the cake was red velvet. This created a monster, (no pun intended) because Jay, my steadfast and boring vanilla cupcake eater, became a red velvet fan after deciding to try it (admittedly under the influence of mucho alcohol). So while I’ve made them in the past, he’s never tried them. Ever. I guess I never plied him with enough alcohol. 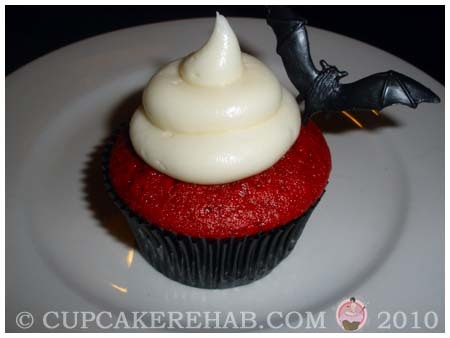 But he’s a big fan of cream cheese frosting too, so I figured I’d make some red velvets being that I hadn’t made them in a long time, and Halloween is fast approaching, making it a perfect time for some vampire themed-cupcakes. And of course, in said true cheeseball fashion, I went with that vampire theme- bats & all. Yeah, I know. But they look awesome, don’t they? Sink yer teeth into these. Haha! Another cheesy joke. I’m full of ’em tonight. Talk about the best red velvet recipe EVER. And nothing says ‘drama’ like red velvet. 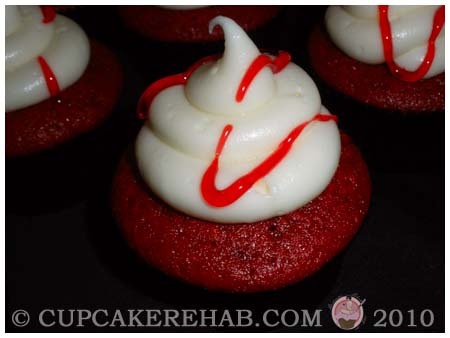 They can be adapted for so many holidays- Christmas, Valentine’s Day, Halloween, even an Oscar party (red velvet/red carpet!?) And when decorated simply, they are so striking. These are Magnolia Bakery‘s red velvet recipe. I’ve had bad results with any other recipe, so I refuse to even attempt a new one. I used black liners (how spooky!) and topped them with a vanilla cream cheese frosting, put black bat toppers on ’em and on some, I just drizzled red gel icing. If you watch the show or have read the books, you’ll understand why these scream “FANGTASIA” to me. Especially the ones with the red icing on top. The measurements here are a bit wacky, but that’s because it’s halved. Halved, you’ll get about 21 cupcakes. That’s mainly because they rise like crazy, so you have to only fill the liners halfway. Otherwise you’ll get mushroom-looking cupcakes. The full recipe makes way more than anyone needs. Unless you’re having a Halloween party. In which case, double this recipe and where’s my invite? Preheat oven to 350°F. Line pan with paper liners. In a large bowl cream the butter and sugar until very light and fluffy, about 5 minutes. Add the eggs, one at a time, beating well after each addition. In a small bowl, whisk together the red food coloring, cocoa and vanilla. Add to the batter and beat well. In a measuring cup, stir the salt into the buttermilk. Add to the batter in three parts alternating with the flour. With each addition, beat until the ingredients are incorporated, but do not over beat. Fill cups ½ full and bake 20-25 minutes, Cool in pans for 10 minutes, then remove from pans and cool completely. *Use one whole egg and then crack one in a bowl, beat it and use half.. or you can live dangerously and use two eggs (which is what I do every time I make these). Whip the cream cheese mercilessly in a mixing bowl until smooth. Add butter and beat that mixture senseless to combine it. Add vanilla and beat in powdered sugar a little at a time into submission until frosting is as thick and sweet as you’d like. So dramatic. Eric Northman would approve. Some other decorating ideas would be to put little sets of plastic fangs on top, like the ones you use when you go as a vampire for Halloween when you’re a kid. Or, take one cupcake and crumble it into fine crumbs, and sprinkle that on top of the rest. Or, sanding sugar in red or black. Adding vanilla bean to the cream cheese frosting would really add something flavor-wise, too. Plus you’d get those awesome little black flecks. 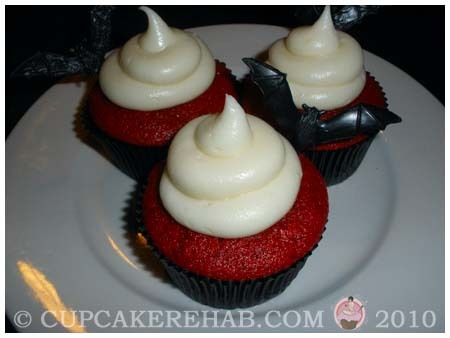 I’d serve these with Tru Blood bottled beverage at a Halloween or True Blood-themed party. Tru Blood is a bottled blood-orange flavored non-alcoholic soda that mimics the synthetic blood that the TV show it’s featured on gets it’s name from. 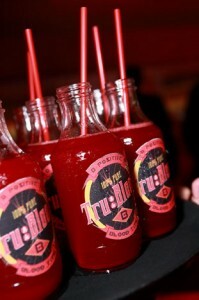 Tru Blood is a bit pricey, true, but it’s a cool novelty drink idea for a party (or for big fans). Another option is to serve these with Bloody Mary’s, or a Black Widow: simply add some ice to a highball glass, then pour in some cranberry juice. Then top it with 2 oz. of Blavod black vodka and you have an awesome looking drink. If you’re not into any of that, plain ol’ POM Wonderful pomegranate juice or fruit punch works just as well as a bloody-looking cocktail. This is a perfect time of year to take advantage of the spookiness of the way certain food & drinks look. Even guacamole at this time of year can be a great food choice, because you can call it anything gross and it’ll work. Same with refried beans! Dark chocolate cupcakes, red velvet cupcakes & white cupcakes colored green, purple or orange with food coloring can all contribute nicely to the theme. And drink-wise; any drink with Midori would fit into a witchy-theme too. Just go crazy! Anything goes. I’ll be back later on this week & next with more Halloween-y recipes. If you’re not satisfied with that, check out this post; you may have missed it before. It’s all about fall and Halloween themed cupcake and other dessert & treat ideas. Next Post Coco-rum pumpkin muffins. How fun! can’t wait to try these! 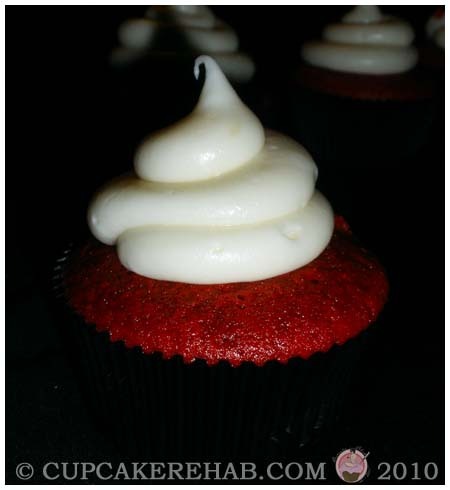 They’re the best red velvets I’ve made… great color and texture. i just made these tonight; they turned out gorgeous. your recipes seem to be a consistent sure-fire – thanks!! I luv your blog! Awesome recipes! so many helpful info here within the publish, we need work out extra techniques on this regard, thanks for sharing. of this paragraph, in my view its truly amazing in support of me. Still, the posts are too quick for newbies. Could you please extend them a little from subsequent time? Excellent beat ! I would like to apprentice even as you amend your web site, how can i subscribe for a weblog website?